What is a "snacking cake," exactly? As far as I can figure it, it is a simple cake, one that can be frosted in the pan and served directly from it. No layers, no decorations, no fuss. This one has been on my to-make list for a while because of the cold factor, and when I desperately needed to make something to post to the blog in time, this was a great pick because everything is a pantry ingredient. In a medium bowl, whisk the cocoa, flour, baking powder, and salt; set aside. In a mixing bowl, cream butter and sugar until light and fluffy. Beat in eggs, one at a time, then beat in vanilla. Reduce speed to low. Add flour mixture alternating with sour cream, starting and ending with the flour mixture. Spread batter into prepared pan. Tap pan firmly on counter top several times to force out large air bubbles. Bake until a toothpick inserted in center comes out clean, about 30 minutes. Don't over bake. To make the frosting: Heat the cream in a 2 cup glass measuring cup in the microwave until simmering. Add in the chocolate and let sit for 10 minutes, and then stir until smooth and glossy and the chocolate is all melted. If the chocolate isn't completely melted and smooth, zap it for another 15-30 seconds in the microwave. Add the sugar and cocoa powder and whisk until completely smooth. Pour over the cooled cake. Put the cake in the refrigerator to chill and set the frosting. I like to leave it there for a couple of hours. Serve cold, and store in the fridge. -I used a 9x9 square pyrex and ended up baking it for 40 minutes. It probably only really needed 35. As mentioned in my previous blog post, my reading friend adapted this cake to a orange coconut cake, but once she'd mentioned it I couldn't get it out of my head I had to make the original. I used coconut sugar instead of regular to make it a bit lower on the glycemic index, but otherwise kept it the same. This cake has one strange technique and a few strange ingredients - you must boil oranges a few hours (and then you use the entire thing, peel and all.) Since the "flour" is all almonds, you can see some nobbly bits. The end result is not overly chocolatey but reminded me more of a gingerbread in texture. Preheat the oven to gas mark 4/180°C (350F). Butter and line a 20cm springform tin. Add the eggs, baking powder, baking soda, almonds, sugar and cocoa to the orange in the food processor. Run the motor until you have a cohesive cake mixture, but slightly knobbly with the flecks of puréed orange. Did You Ever Have a Coconut Orange Cake? I recently read Did You Ever Have a Family? by Bill Clegg, a novel that was longlisted for the Man Booker Prize and the National Book Award in 2015. The story revolves around a tragic event, a family dying the night before a wedding is to occur. But some of the characters, who narrate their own chapters, talk about the cake that was requested for the wedding. It seemed unusual, so of course I had to make it. Another reading friend was reading the book at the same time, and also tried a version which I hope to at least link to below. "My mom made Lolly Reid's wedding cake. She got the recipe from a Brazilian restaurant in the city where she went one night after going in with her friends to see a show. It was a coconut cake made with fresh oranges. She prepared for days. It didn't have any pillars or platforms or fancy decorations; just a big sheet cake with a scattering of those tiny, silver edible balls...."
All I knew, since Clegg has not made the recipe he had in mind available anywhere, was that it had coconut and orange, should be a sheet (as opposed to a layer cake or bundt), and that I could add some of the tiny edible balls. I found two recipes I was considering. Both were in tube or bundt pans, but I knew that would roughly fill a 9x13 pan. One recipe that had the central ingredients and also identified as Brazilian was the Brazilian Flair Orange Cake with Coconut, but it seemed to be orange with coconut as a garnish, and I read the focus as being on coconut. I put that one aside for the Brazilian Cold Coconut Orange Cake, since it seemed to have the right flavor focus. It is assembled somewhat like a tres leche cake, where you pour a mixture of milks over the warm cake after poking holes in it. This is where the recipe went wrong for me, though, because it became too moist. I didn't end up taking it for coworkers to eat or anything! I suspect their "can" is a different size than my (14 oz) "can," but didn't think about it when mixing everything together. The cake as it was, with a simple glaze, would have been a delight. I also think the pictures accompanying that recipe don't look like they followed the end of the recipe, just made the cake part. My reading friend Trudie liked the book less than I did but made a better cake. She started with Nigella Lawson's Flourless Chocolate Orange Cake, replacing the cocoa gram to gram with coconut. The color was so vivid, and the cake looked more like a cake and less like a pudding. So beautiful, thanks Trudie! 1. Boiling up the oranges is critical as I have made this before and took a short cut with the boiling time and the oranges are too bitter, (however I have seen mention of microwaving them, to save time). The rest of the cake takes about 10mins to assemble - so it is just this stage needs planning. It's Labor Day, and my husband has now been at his new job at Clemson University for a month! 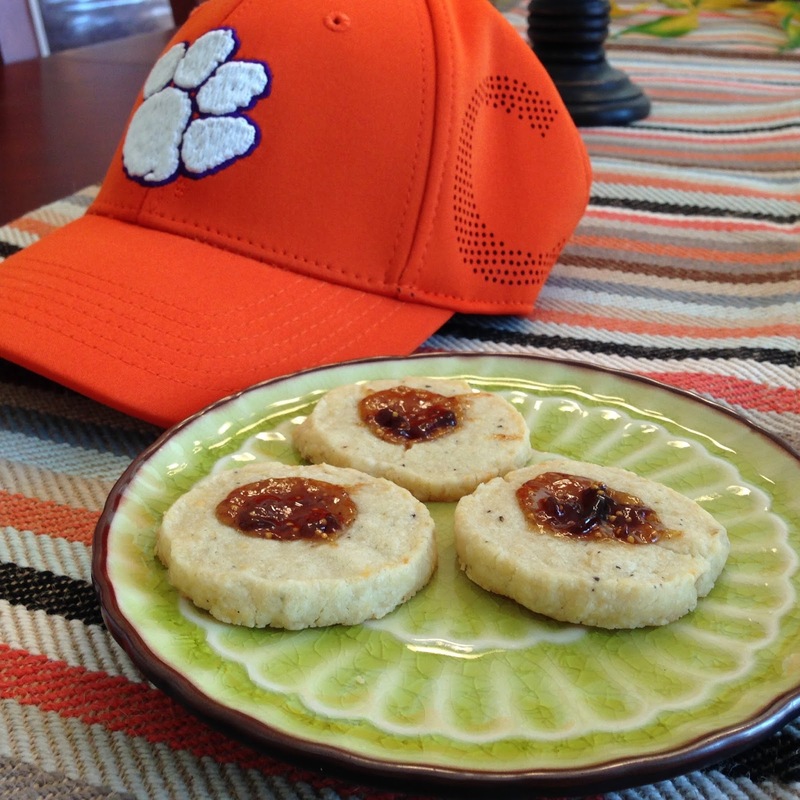 Clemson has been making blue cheese on campus since 1941. It even has its own website. N- brought home crumbles to try, and while we enjoy them in the various places we typically put blue cheese, I wanted to find a recipe that would better feature the cheese. These little round savory cracker-cookies topped with fig jam would be perfect on a cheese plate or at a tea - the perfect balance of savory and sweet. They come together quickly. I made a few changes in that I rolled the dough in plastic wrap and chilled it 15 minutes, then sliced and baked. I didn't get quite as many as 3 dozen, but thought that would be easier than rolling them out. Place the flour, butter, blue cheese and a few grinds of black pepper in the bowl of a food processor. Process until the dough just comes together and starts to form a ball. Dump the dough onto a lightly floured surface and knead a few times to pull the dough together. Roll out to 1/8 inch thick with a floured rolling pin. Cut rounds out of the dough with a floured 1-inch cutter and transfer the rounds to the parchment-lined baking sheet. Using the back or a round half-teaspoon measure or your knuckle, make an indentation in the top of each dough round. Spoon about ¼ teaspoon of fig preserves into each indentation, using your finger to push the preserves as best as possible into the indentations. Bake the savories for 10 – 14 minutes, until the preserves are bubbling and the pastry is light golden on the bottom. Let cool on the baking sheet for at least 10 minutes, the remove to a wire rack to cool. You’ll find fig preserves at the grocery – it may be shelved with the “fancy” jams and jellies. You can make these a day ahead and keep them in two layers separated by waxed paper in an airtight container.